Polyurethane Shifter Bushings from Prothane will firm up the play in your shift stick caused by worn stock bushings and make those gears easier to find. Check out Prothane's shifter bushings for your vehicle below. The original shifter bushings on your vehicle are made of rubber which do a good job of absorbing vibration, but over time all the flexing and bending will wear the bushing out and result in a loose shifter. This can cause sloppy shifting and even missed gears since the shape of the rubber bushing is changed by the stress of normal travel. If you're regularly putting your car through it's paces on the local track then constant hard shifts can accelerate the wear of those original bushings. 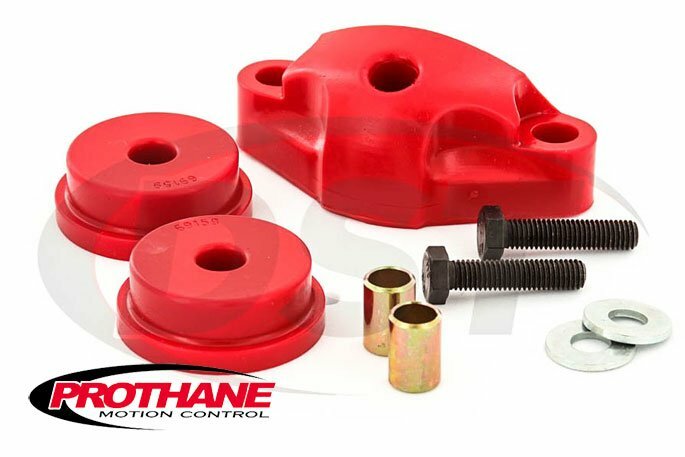 Prothane's shifter bushings are made with their special formula polyurethane which is much more durable than rubber. Poly bushings hold their shape through even extreme circumstances and aren't affected by motor chemicals, road salts, and other elements that can degrade rubber bushings. These shifter bushings won't leave you trying to find the next gear like worn rubber bushings and will provide a smoother shift, so take a look at Prothane's shifter bushings! Prothane's bushings are Made in the USA and covered by a Lifetime Warranty.